The conventional deadlift is a great exercise that most people have a tough time setting up for or knowing where to put their hands and feet. To make things simple, this video illustrates how to properly line up for a a good pulling position. First, set up the feet. 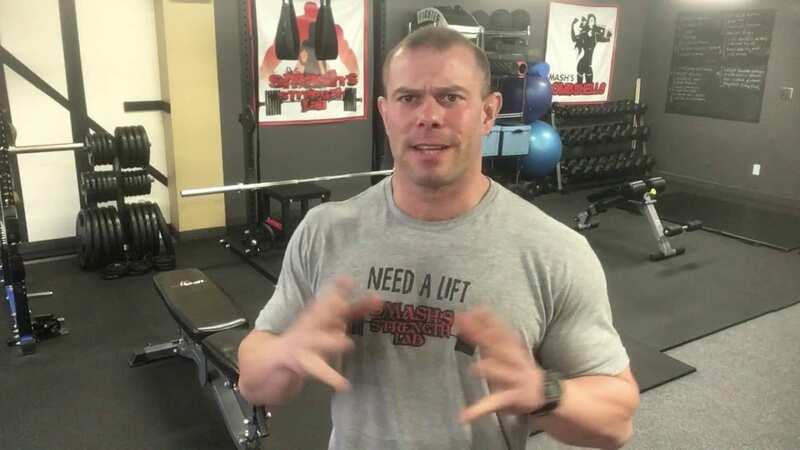 For the conventional deadlift you're going to want a fairly shoulder width stance with the toes pointed straight ahead or slightly outward (20-30 degrees), keeping the knees in alignment with the toes. Keep your shins touching or close as possible to the bar. Normally a barbell will have an open area without knurling or the rough grip section of the bar to gauge your foot placement. Second, push the hips back and rack down to grasp the bar firmly. In the overhand grip position you should have an equal grip that's roughly just outside the knees and ankles. If you need a measurement, use your thumb as a gauge of the distance between the bar and your legs. Third, pull the hips down and pull the chest up, while squeezing the shoulder blades together. It often helps to think about pulling the elbow in to protect the ribs or simply squeezing your shoulder blades together as tight as possible. The bar should have all of the slack taken out of it with the shoulders and hips dropped to a descent position. Fourth, take a deep breathe through the nose and then through the mouth to create enough tension in the core to pull the weight safely. Hold your air in tightly. Don't breathe until the weight has lifted from the floor. If you have trouble with this you may have to visit the post on 'core bracing' so you can pull those heavier loads. Fifth, pull the weight safely from the floor, breathe out a bit at the top of the movement, then return to the floor, while keeping the core muscle braced tight. Now, some people will have a slightly wider stance due to limb length and comfort, but overall you should feel tight and solid when you pull into the bar upon setting your grip. In the case of knee pain, deadlifts are generally a solid exercise to help get the posterior chain fired up without causing knee pain to be aggravated. A helpful hint in this type of scenario is to position a mat so that the toes can't drive into the floor and emphasize placing the weight on the mid-foot and heal. Stay tuned for our upcoming Program Vault addition Training Thru Knee Pain, which will feature a workout designed for training around knee pain and still making gains!